Red Venture celery seeds. I had a heck of a time getting this celery to sprout at all in this climate, now it has gone to seed in my garden and grows as a weed. 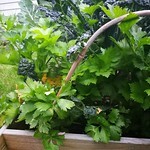 This is a very strongly flavored celery that is stringy and does not develop much stalks but it is excellent for soups and develops copious seeds that can be used as a spice (I have plenty of older seeds for that purpose as well). 1000 is a wild estimate. I have "lots" of seeds.